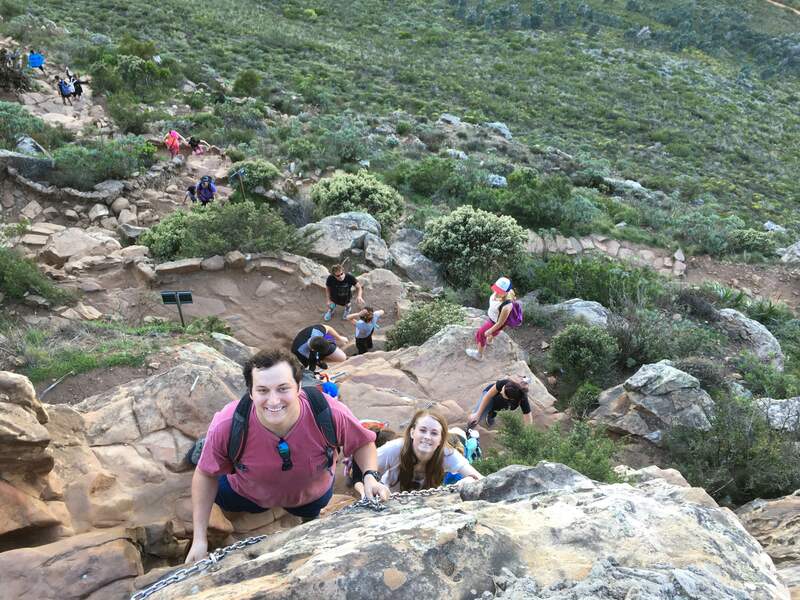 Mari Liza Almand, a student from the University of Mississippi, describes her physical and emotional journey climbing Lion’s Head, one of Cape Town’s most iconic and scenic landmarks! I gazed at the red-dirt, gently inclining path that laid in front of me, inviting me to venture on. I had hiked mountains along the Blue Ridge Range back in the states without breaking a sweat, and this path seemed much kinder than those I had seen before. My past experiences prepared me, or so I thought, to conquer this Cape Town landmark. Our team began up the trail only to be met by a steeper incline with each winding turn. My calves and hamstrings began to burn and sweat dribbles formed above my brow; this journey would be more challenging than I previously thought. Then, we confronted the harder part of the hike as we were required to literally rock climb and cling to chains and previously placed grips along the mountain. As I climbed and clung to the side of Lion’s Head, I realized that I was not paying attention to the people around me when I was struggling to keep my breathing steady and heave myself up each boulder; I was only focusing on the present and each step I had to take. Therefore, we decided to take “picture breaks,” where we would stop, take in the scenery, and really see, not just look at, where we were. With each break, we grew closer as a group as well. We began to talk about our greatest dreams, most controversial opinions, and deepest fears, and some in the group were attempting to conquer theirs as they ventured up the mountain. Finally, we reached the summit 2,195 feet above sea level. A feeling of vulnerability overcame me as I stood atop this massive mountain. As cheesy as this sounds, I felt uncomfortably small as I gazed out into the ocean to see a steam boat the size of a Lego. But as I embraced this discomfort, a warm ease consumed me. I realized how small I am in comparison to the entire world and how small the problems that used to ravage my mind are. Atop Lion’s Head, I was 8,387 miles from home and a mere 10 miles from the impoverished Townships established during the Apartheid era. Any issues back home in Jackson, Mississippi, are meaningless, especially in light of the greater social issues so painfully present in the beautiful country that has welcomed me for the past two weeks. So, as I sit and peer out at the world around me, I begin to think of my future. What will I do to change myself? To change the world around me? Yes, I am small; I am only one person, but even one person can make a small contribution to a big change. This entire trip, in my eyes, is centered on the idea of being mindful of my surroundings. I guess I will not know until I truly grow into a mindful traveler, a goal I am working on each and every day. Sounds like that mountain holds a great deal of wisdom. Hotty toddy!